I wanted to think about big and small ways in which we can start over. If you have been feeling like you want to hit the reset button on your life, keep reading! Challenge yourself to a new hobby or sport that you have always wanted to try. Learning new things keeps us feeling invigorated and shows us that we are capable of learning and growing at any age. Whatever your fear is -- flying in an airplane, swimming, being in an elevator, or public speaking -- do the thing that scares you most. As Susan Jeffers says, "feel the fear and do it anyway." Drinking, smoking, gambling, over-caffeinating... Whatever you have been overindulging in, make a plan to stop. According to Dr. Phil, people don't break bad habits, they replace them with something else. 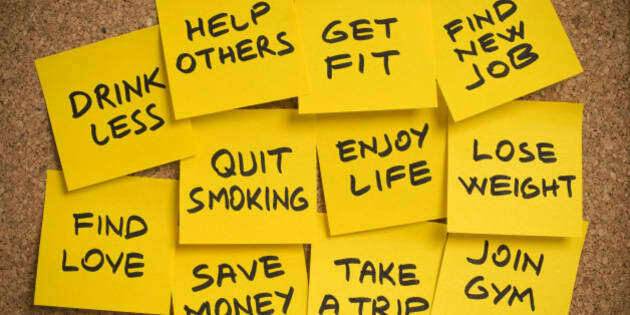 Get the necessary help to replace your bad habits with good ones, and prepare for a great new beginning. This weekend my hairdresser extraordinaire, Sonia, cut half a foot off my long hair. It feels like a whole new me! Making a small change like cutting your hair or styling it in a different way feels great and could possibly inspire other, bigger changes. Starting a new job is a great way to start over. If your boss is making your life miserable, you are being paid peanuts, or your commute is driving you insane, maybe it's time to start looking around. Don't stay in a bad situation; try to change it. You are likely not as trapped as you think you are. Whether you move apartments, houses, or even cities, there is something about packing up your life and unpacking it in new surroundings that is cathartic. If you're not moving anytime soon, you could rearrange your home using the principles of feng shui to increase its positive energy. This way, you get the benefits of moving -- without any packing! According to Brian Tracy, "your 'frog' is your biggest, most important task, the one you are most likely to procrastinate on if you don't do something about it." If you can get this one done, making other smaller changes will feel easy in comparison. Yes, I know that it's not New Years! I'm only asking for one -- in writing. Research shows that if you write a resolution down in as much detail as possible, you have a much better chance of making it happen. Whether you go on an all-inclusive vacation, travel to a foreign country, or have a staycation, take the opportunity to think about where you're at, and where you're going. Use the time away from the daily grind to consider what you can do differently when you get back. It doesn't matter where the debt comes from, pay it off! Whether you maxed out your credit cards, are paying off student loans, or went through a negative financial life event (divorce, bankruptcy), debt is a huge burden that you must deal with. You will have a great new start when your money is your own again (after taxes, of course!). Making a new friend can expand your horizons, especially if they have different hobbies and interests than you. You may find yourself trying things that you never imagined you would. If you have wronged someone and are still carrying the burden of your mistake, offer a heartfelt apology. It does not matter what their reaction is: Do it for you! After you apologize, forgive yourself and move passionately onward with your life. If you are holding a grudge against someone, you are only holding yourself back. Truly forgive them. You don't have to forget, but you should release yourself from the burden of holding onto any anger or resentment over what happened. If you have been single for a while, the best way to begin your love life anew is to start dating again. You may not meet your prince or princess on the first try, but you have to start somewhere! Get back out there and you will be on your way to finding love again. Make your life easier by getting rid of everything that you no longer need or use. Whether you throw the items out, give them to someone in need or donate them, decluttering works. It is a perfect way to start fresh! I hope that you found at least one way to set an intention to make a change moving forward. You owe it to yourself to live your best life possible. Make any necessary changes that will set the wheels in motion, and eventually have you living the life that you always wanted for yourself.